If you have anorexia, it can be difficult to see yourself clearly, even after treatment. That's why it's so important for you to have resources available to prevent relapse. Written by three psychologists and experts in eating disorders, this important guide provides evidence-based skills blending acceptance and commitment therapy (ACT), cognitive behavioral therapy (CBT), and dialectical behavior therapy (DBT) to help you recover-and stay on the path to recovery. Each chapter of this workbook focuses on a theme-each important to fostering and maintaining recovery from anorexia, including: managing treatment and maintaining progress, creating and maintaining a therapeutic team, rebuilding healthy relationships and decreasing investment in unhealthy relationships, and gaining a sense of autonomy. Additionally, you'll gain insight into your anorexia, learn why it's all about control-and learn how to gain real control in healthier aspects of life. Finally, this workbook addresses developing healthy goals related to eating, as well as career, academic, and recreational goals to assist in leading a fulfilling life. You'll learn to take time for self-care, plan for challenging and difficult times throughout recovery, and maintain changes in behavior and thought patterns, such as awareness and tolerance of negative emotions, reaching out for help when needed, and effective communication. 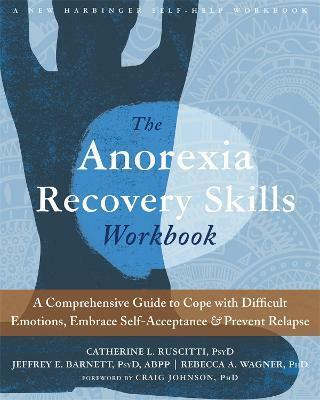 "The Anorexia Recovery Skills Workbook is a wise, compassionate, and comprehensive book! I just wish it had appeared on the shelves many years ago, so I could have used it when I was struggling. I highly recommend this book!" --Jenni Schaefer, author of Goodbye Ed, Hello Me and coauthor of Almost Anorexic and Life Without Ed "This workbook is a practical and helpful tool for individuals working towards recovery from anorexia nervosa. The inspirational quotes, case examples, and ample opportunities for self-reflection make it user friendly and also quite personalized. I commend the authors for providing another, and much-needed, contribution to the tool kits of eating disorders treatment." --Ovidio Bermudez, MD, chief clinical officer and medical director of child and adolescent services at the Eating Recovery Center "The path to recovery in anorexia is often confusing and convoluted. The Anorexia Recovery Skills Workbook provides a structured map for this arduous journey. It provides hope and practical tools for recovery, while acknowledging the difficulty of the recovery process and giving permission for struggle. Clinicians and clients will find this book to be an integral part of treatment for this complex eating disorder." Catherine L. Ruscitti, PsyD, earned her doctor of psychology degree in clinical psychology from Loyola University Maryland. She completed her pre-doctoral internship at Baylor College of Medicine, Menninger Department of Behavioral Sciences on the Adolescent/Adult Track at The Menninger Clinic in Houston, Texas. Ruscitti is currently a post-doctoral fellow on the Compass Unit for Young Adults at The Menninger Clinic where she provides psychotherapy and assessment services to young adult inpatients. She is also continuing her research at The Menninger Clinic examining emotion regulation difficulties in inpatients with eating disorders and participating in an eating disorder research team. She is interested in pursuing a career in adolescent and adult psychotherapy and assessment at an inpatient psychiatric hospital, with particular interest in the treatment of eating disorders, mood disorders, anxiety, and personality disorders. Jeffrey E. Barnett, PsyD, ABPP, is associate dean for graduate programs and the social sciences, and a professor in the department of psychology, at Loyola University Maryland and a licensed psychologist in independent practice in Baltimore, Maryland. He has given over 200 presentations and workshops for mental health professionals and has over 200 publications in print and online. Jeffrey Barnett has published nine books thus far, one of which is in its second edition and one of which is in its seventh edition. He is widely published in ethics and professional practice issues for mental health professionals with many of his books being written broadly for all mental health professionals, not just psychologists. Additionally, he has received numerous professional awards on the national level and has presented regularly for decades at conferences for mental health professionals. Rebecca A. Wagner, PhD, is the director of eating disorder services and codeveloper of the Eating Disorder Track at The Menninger Clinic. Wagner's professional interests include the efficacy of an innovative approach to the treatment of eating disorders, body dissatisfaction, emotion dysregulation, self-harm, and suicide within the eating disorder population. She regularly serves as a consultant for eating disorders within the Houston area and works closely with many eating disorder treatment centers across the nation.